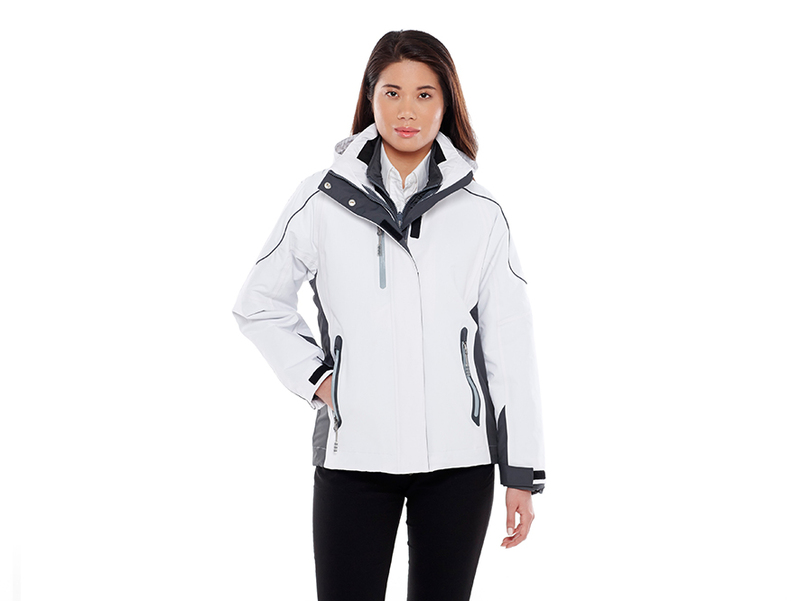 This critical seam-sealed outer shell jacket features a removable liner with channel quilting and a detachable hood. Engineered with reflective heat transfer shoulder detailing and non-chaffing heat-transfer interior neck label and tech label. Center front stormflap with hook and loop closures. Lower laser-cut welded tape waterproof zippered pockets and right chest laser-cut waterproof zippered pocket & all with easy-grip pulls. Handy interior patch pocket & mesh storage pocket. Articulated sleeves offer ease of movement. Half elastic cuff with adjustable cuff tabs. Dropped back hem. Adjustable drawcord & toggle at hem. Women's version features shaped seams for a more flattering fit. Removable channel-quilted liner also features non-chaffing heat-transfer interior neck label and tech label, plus lower reverse coil zippered pockets with easy-grip pulls. Dropped back hem with adjustable drawcord & toggle. Women's version features shaped seams for a more flattering fit. Shell: 100% Nylon taslan with waterproof (2000mm) and breathable (3000g/m²) coating and water-repellent finish on the surface. Lining: 100% Polyester mesh on upper body. 100% Polyester taffeta on lower body, sleeves & hood. 100% Polyester brushed tricot on inner collar and pocket bags. Component Jacket Shell: 100% Polyester with water-repellant channel quilted to soft polyfil insulation.